Deploy self-service business intelligence throughout the enterprise and visualize data with QMF. 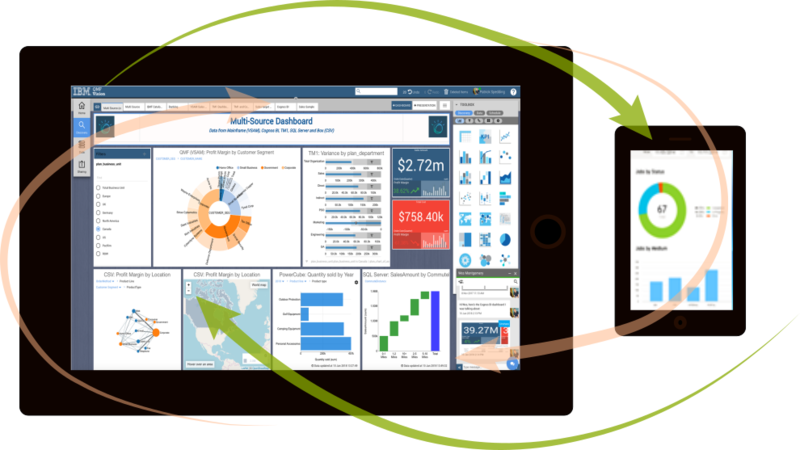 Share dashboards quickly and collaborate with your peers. Deliver the ability to analyze all operational and transactional data on IBM System z, using IBM zIPP engines and appliances to minimize CPU cost increases. Support access to a variety of structured and unstructured data sources including web services data, relational databases and Spark. Enables all business users to build visualizations, dashboards and reports from multiple data sources with no programming required. Automatic creation of initial visualizations with QMF can make an analyst out of any business user. You have to analyze and solve why there has been a decline in deposits over the past few months. The data is in multiple data sources including the mainframe. And you need to collaborate with an extended team to find the problem and solution. Use QMF's Vision interface to create a visualization across the different data sources. Use the visualization to find the problem, and use the integration of QMF and collaborative software such as IBM Connections to solve the problem. VSAM is used to store your business transactional data . To analyze this data for business decisions, the data is moved off IBM Z on a daily basis . Moving the data incurs mainframe costs and does not allow for timely insights or decisions. Do not move the VSAM data off IBM Z. Analyze it and visualize it in place with QMF modern dashboards and visualizations . Lower costs by diminishing data movement, and by using QMF's data virtualization technology that exploits zIIP engines.